It’s a week before Christmas and I still haven’t made a single present. I’ve bought plenty of them but I haven’t built a single one. Let me explain. As I mentioned in my last article, I planned to make a hanging desk for my son’s loft bed. Late Friday night my wife mentioned to me that the young daughter of one of her friends is having a constipation issue. Being the good friend that she is, she told her that her husband (me) can make her a step stool to help with the problem. What kind of magic is this? 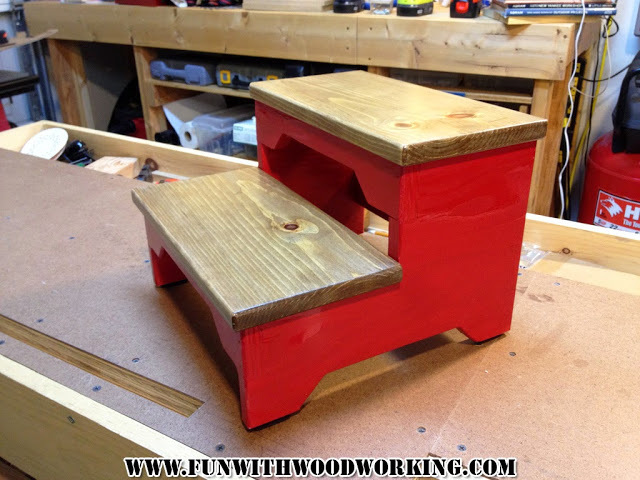 A step stool? Let me explain. Halfway through potty training my older son I saw an ad for a squatty potty so I started having him put his feet up on the step stool that we had built together when he had to go #2 and it really helped. We just naturally did this with the second son and it has helped immensely so I recommend it to any friends or family that start potty training their children and it really seems to work well for them. So now I’m making a stool instead of a desk. That’s fine, just let me go out to the shop and make something and I’ll be happy. We had a birthday party to attend for the son of good friends at 1:00 so I ran some errands in the morning and then we spent a few hours at a local go-cart track for the birthday party. All the kids got to race 2 laps and all the dads did too. It was a good time. We left the track and headed home to get ready to attend a hockey game for our local minor league hockey team. My younger son sold enough Cub Scout popcorn that he got us free tickets for the game and also got to go out on the ice to help present the American Flag at the beginning of the game. It was a good day with family and we all had a great time. Project time was scheduled for Sunday. Cue 8:00 am Sunday morning and my wife woke me to tell me that she had been up all night throwing up. She took over the bedroom and I went downstairs to look after my boys. We made pancakes and french toast. We went to Target so that they could buy Christmas presents for mom and grandma. We went to Carl’s Jr for lunch (I had gift cards) and made a bunch of finger foods for dinner. All the while checking in on my wife throughout the day. (Toast, applesauce, chicken noodle soup, and water for her). At the end of the night the younger son and I worked on his catapult kit that he won at another Scout event related to popcorn sales. I never did make it out to the shop last weekend. I’m not upset about it. Family always comes first but I would be lying if I said that I wasn’t getting antsy to build something. I bought a present for our family gift exchange with the sole intent of building a box around it similar to the one I made a few years back. My current plan is to build that on Saturday. Wish me luck!